My experiences are based off the 2018 Sundance Film Festival and are entirely my own. “Don’t do it. Don’t go past the studio zone.” – Joe Wallenstein after I asked him permission to leave for Sundance. To get to the film festival I drove with my dear friends and fellow SCA students: Ben Scott, Tim Schauer, and Eri Takada. The 12 hour drive from LA to Salt Lake City may seem grueling to some but I’ll share our secret: some Muddy Buddy snacks and at least two Kanye albums (Yeezus and Life of Pablo). “I got blasted into space and left the safety of our ship to walk on the moon so that I would have a leg up on networking.” – Neil Armstrong on the importance of Networking. One of my companions on this trip got a sweet hookup through his mom and got us very cheap housing in Salt Lake (about 30 minutes away from Park City). It’s clear that my friend has been listening in class and actively using the dark magic of networking. I recommend you do the same. “After I made Chef and had the experience of molding and crafting food, that was truly something else, I realized I was doing the wrong job” – Jon Favreau on how food inspired him to become a gaffer. This was the most painful part of the festival. So many of the food places around the theatres were incredibly expensive…however some were delicious. Yes you read that correctly, cream cheese. My friends thought I was a madman ordering cream cheese with a burger. Well guess what? It paid off. One of the best burgers I have ever eaten and only $8.29. Worst Restaurant: Main Street Pizza and Noodle. Very mediocre and crazy expensive. Lame. Pro tip: I highly recommend going to any of the many 7/11s and stocking up on snacks. This is also a general life tip too. “I hate making movies, it bores me, the hours are long, the people are weird, it just bums me out generally.” – Steven Spielberg to a child waiting for the bus. Go see them! 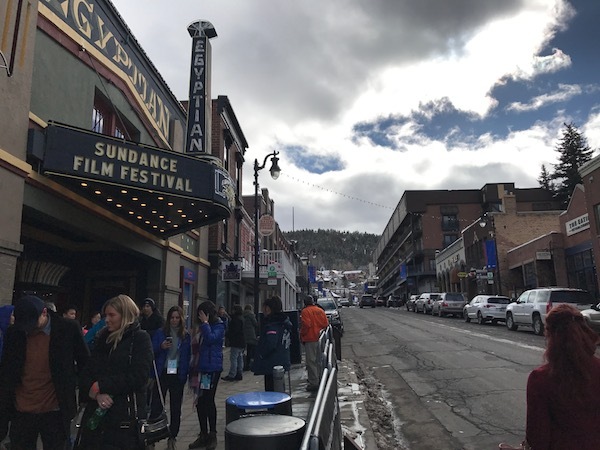 Sundance uses their app to get festival goers on the waitlist. It is very glitchy but can certainly pay off. However, don’t be like me and accidentally go to the wrong theater. “Kuba has fantastic taste.” – Dr. Drew Casper to Dean Daley on Kuba Soltysiak’s taste in cinema. Eighth Grade – A teenager tries to survive the last week of her eighth-grade year before leaving to start high school (IMDB). Simply incredible. First-time director Bo Burnham has made a modern telling of middle school that anyone can connect to. It is simultaneously hilarious, painfully awkward, terrifyingly tense, and wonderfully heartwarming (hell yeah I cried during this movie). Assassination Nation – This is a thousand percent a true story about how the quiet, all-American town of Salem, absolutely lost its mind (IMDB). This movie was so visually striking and had such a 21st century plot revolving around the impact of social media and technology on our private lives. “Gee whiz that was a hell of a ride.” – You reading this article. The ingredients to having a great time at Sundance: good food, warm clothes, great friends, and 7/11. This was a Sponsored post by the 7/11 corporation. This entry was posted in Uncategorized by rgilmour. Bookmark the permalink.